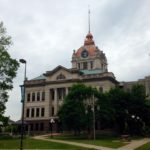 The Brown County executive’s office is speaking out against a recently-filed lawsuit aimed at stopping the county’s newly-implemented half-percent sales tax. Deputy Executive Jeff Flynt questions why the Brown County Taxpayers Association would file suit against the tax, which is expected to fund $147-million dollars in infrastructure projects. Flynt says the county anticipates moving forward this year with planning for road repairs, a new jail pod, and a museum exhibit redesign. Flynt claims there would be multiple repercussions if the county had to instead bond for the money to cover the various efforts. The Taxpayers Association says a failure to reduce the property tax levy makes the tax illegal. They are asking for a temporary restraining order on the tax being collected, with the tax having gone into effect on January 1. However, no court dates had been scheduled at last word.